I remember when I was a child people used to make onion soup with a slice of white bread and grilled cheese on top. I liked the soup, I liked the melted cheese but I would have prefered the bread if it hadn’t been soaking in the soup getting soft and soggy. That was never my thing, I also don’t dip my cookie in tea or croissant in my cappuccino. I don’t like pastry pieces swimming about soaking up liquid, neither sweet nor savory. Each to their own but this is not for me. 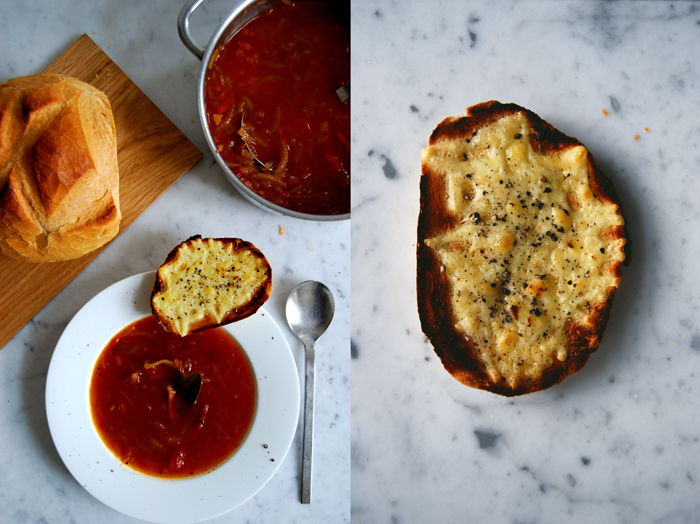 However, the combination of onion soup, bread and cheese is great, especially in winter. It’s warming, a treat to the body, and it’s rich and feels like a real meal. 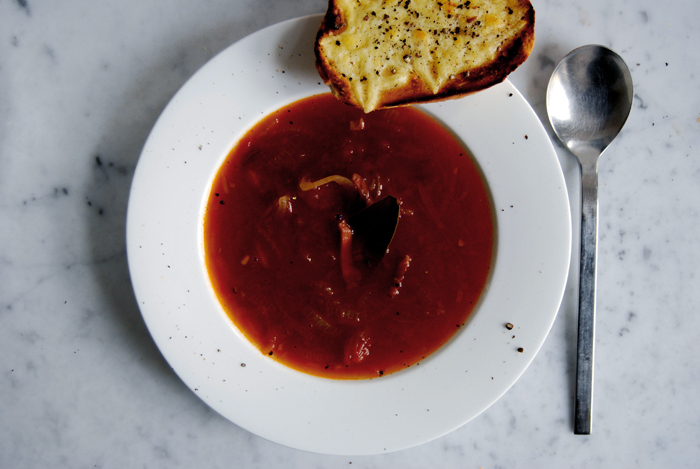 I found peace with my bread very easily by just keeping it out of the soup, it stays crisp and crusty and I can still enjoy this hearty combination. My soup is bright red as I add tomatoes to the broth, a nice change to the snowy grey outside my window, and a little spicy because I cook dried chili with it. I mix the onions with thick strips of Tyrolean Prosciutto from Mr. Pizzinini in San Cassiano. The spices of the prosciutto fit perfectly to the soup as I also use clove, bay leaf and rosemary. While the soup is bubbling in the pot for half an hour I put thick slices of white bread covered with Raclette cheese under the grill. This alone would have already put me in a very happy mood but together with the soup I must say I’m at peace with the world! For the crostini, cut a loaf of white bread into thick slices, cover with grated Raclette cheese (100g / 3.5 ounces of cheese should be enough for 4 people) and put under the grill until golden brown. Sprinkle with crushed pepper. Heat a little oil in a large pot and fry the prosciutto until crisp. Take it out, add some more oil and fry the onions with the sugar for around 10 minutes until soft. 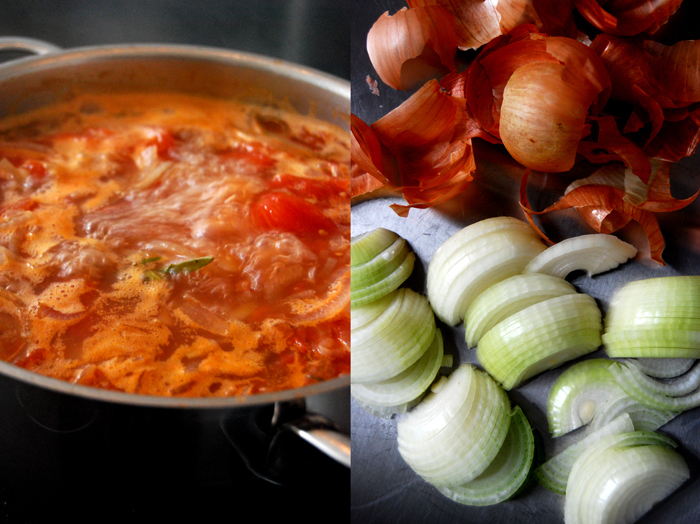 Add the tomatoes, broth, spices and cook for 30 minutes on medium heat. Season with salt and pepper to taste and serve together with the grilled Raclette crostini.